FHI (Fuji Heavy Industries Ltd.) gives proof to the world that it is continuing to try very hard to stretch the possibilities of vehicles and their performance to levels that have not been tried or accomplished before. Exactly how have they demonstrated this? Through an exclusive video footage that the company has released; this footage shows the kind of research and experiments that the Subaru vehicles have been trying out and practicing- and all this is done on the Nurburgring’s racetracks which are in Germany. 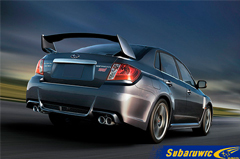 The vehicle that they used for these experiments in the footage is the 2011 Subaru WRX STI 4-door sedan. So what is the concept behind this 2011 Subaru that is being tested? That it would be labeled as the fastest WRX STI to exist ever. You might not be aware of this, but with a Subaru vehicle, this concept of being the “fastest” does not necessarily only mean driving at the fastest speed possible or having the maximum degree of output from the engine, but it also actually means driving with sheer confidence. Therefore, the WRX STI can be tagged as the “fastest ever” only when technology takes it to a level where the driver of the vehicle has complete confidence and control over the Subaru with the fastest ever performance. For the test the most important upgrades made to the 2011 WRX STI were made to the suspension set up as well as the chassis. It was Tommi Makinen who was given the honor of piloting this first test drive.